Anwar is done! PKR is done! It is final. Parti Keadilan Rakyat or Keadilan is finished! Done! Anwar Ibrahim is also done. Ijok was the last nail of the coffin. The by-election which ended yesterday (Saturday, 28 April 2007) saw the “bitter-sweet closure” (bitter for Anwar, sweet for all those who are really tired of Anwar!) of both Anwar Ibrahim and the party which was formed for and about him. Barisan Nasional’s Cikgu K. Parthiban defeated the Mighty Tan Sri Khalid “Saviour of the Malays’ Ibrahim by a sound majority 1850 votes. This humiliating defeat of Anwar’s ‘dark horse’ is all about him trying to salvage his ego, in his attempt to play the Supremo of the Oppositions Alliance. The fact that Anwar’s ten days campaign in Ijok clearly showed how distasteful he was as a politician and lack of real issues that really matters. His campaigned was focused trying to discredit the Deputy Prime Minister Dato’ Seri Mohd. Najib Tun Razak. His ferocious attacks were centred on rumours about involvement in the high profile murder of the Mongolian model, Altantuya Shaaribu and alleged kickbacks worth RM 520 million from the Scorpene submarine and Sukhoi fighter deals. He was not interested about the local issues in Ijok or other issues that binds the domestic political scene today. Despite Najib swore in the name of God of non involvement with the woman and an official MINDEF communiqué issued about the two contracts and parties involved, Anwar still lashed his atrocious attacks. The really funny thing was the issues involving the Prime Minister and/or his infamous son-in-law Khairy Jamaluddin (who happened to be campaigning in Ijok, everyday too!) were left spared and unscathed in Anwar’s daily attacks. He also said different things to different sets of voters. 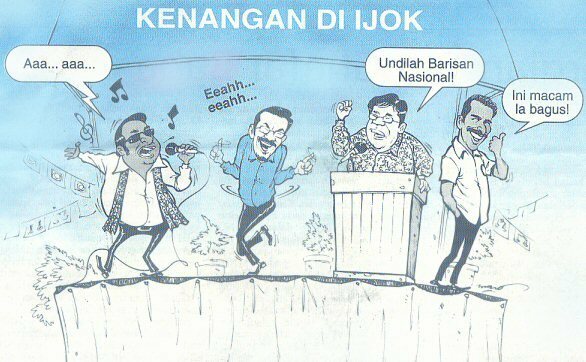 One of the issue which had spread from mouth to mouth was Anwar seen swinging at a tune during one of the campaign. Of course, Khalid’s major blunder campaigning on Ladang Tuan Mee also caused him a lot of damage. The truth is that, PKR lately had been almost an abandoned party. Many stalwarts like Dr. Chandra Muzaffar, Jomo K. Sundram, Marina Yusuff, Nell Onn, Ruslan Kassim and Lokman Noor Adam left. The Mighty Zainur Zakaria and the feared Rahim King also left. Now, Anwar’s own trusted aide, Ezam Md. Nor is on the brink of jumping ship too. PKR now is left with one Dewan Rakyat seat and even that, Wan Azizah narrowly won in the last General Elections. The people are tired and had enough of his brand of rhetorics politics. Anwar introduced mob style demonstrations, a leftist habit he started since his student days in UM in the early 70s. Maybe, when he started his ‘Reformasi’ movement after his 2 September 1998 sacking, the people at large finds in refreshing to have a ‘tangy and spicy voice’ to so called ‘revolutionising the system’. The irony was Anwar was actually part of the system which he is crying wolf now, for over 17 years! The street mob approach became an instant success, espcially amongst rift-rafts seeking kicks on weekends. The clash during elections becomes Keadilan’s signature each time there is a by-election involving this party. Later it no longer become fashionable to demonstrate and riot. After a while, it died down and people no longer believed in the movement. It also ran out of flavour. The fact after Anwar Ibrahim managed to wiggle himself out of being convicted, he chose to go abroad and took offers from Washington D.C. and Oxford ‘fellowship’ positions. That left his ever loyal supporters in the lurch. So many then turned away and re-evaluated their position and support for Anwar. And many made the decision and left. Now after nine years since his first started, Anwar made another pathetic attempt and failed, miserably. If he still doesn’t get now, then he’d probably won’t. Maybe one day when he speaks at the mike and people starts to walk away, then Anwar finally realized that he is no longer wanted! *A further update. “UMNO Secretary General Dato’ Radzi Sh. Ahmad said today Anwar Ibrahim would not be allowed to re-join UMNO”, quoted The Star, Monday 30 April 2007. That basically deprived his realistic chance ever to ascend the Premiership of the country. Hard luck, Anwar! It seemed Dato’ Kalimullah Masheerul Hassan is now back in ECM Libra Avenue as the Executive Chairman, after the so called ‘sold out’ his holding last August. So now it is very clear. Last August’s announcements of Kalimullah and Khairy ‘unloading’ their shareholding in ECM Libra Avenue to ‘so called’ Tan Sri Azman Hashim is just purely, “wayang”. What saddens many, the Public Accounts Committee under the stewardship of Dato’ Shahrir Samad actually ‘bought this lemon’. Lets quickly re-cap what happened throughout 2006. When the news (proposition) of the merger between ECM Libra and Avenue Capital surfaced since early last year, so much oppositions were brought upon by too many quarters in the public and too much controversies were unavoidably high-lighted. Right from Prime Minister (Minister of Finance) Dato’ Seri Abdullah Ahmad Badawi’s iconic response “I dunno, I am not involved”, to the much heated Avenue Capital EGM at Kiara Equestrian Club, 18 May 2006 on pertinent issues like “impairment of goodwill”, “unfair pre-merger ECM price valuation”, “SC allowed the MGO to be waived (which drew the Minority Stockholders Watchdog Group’s strong protest)” and of course, irregular meeting procedures. Still Now, the endless on going PAC hearing which many felt was being steered away from the main salient issues. MAIN drivers and founders of ECM Libra group Datuk Kalimullah Hassan and Lim Kian Onn are back in the saddle at investment holding company ECM Libra Avenue Bhd (ECM). Barely nine months after Kalimullah sold down his stake in ECM and both he and Kian Onn relinquished their executive positions in the company – a move which was perceived by many as the former having succumbed to the pressures of relentless vilification on his business involvements – they appear all set to take up the reins once again. Although Kian Onn stayed on as director and didn’t sell down his stake in the company, he too had taken a back seat in the group. Late Friday, the company announced that Kalimullah, who was appointed as non-executive chairman on June 16 2006, will be redesignated as executive chairman and CEO while Lim, who is currently non-executive director, has been redesignated as managing director. The appointments are effective May 1st. The move has piqued the interest of market watchers as the group has assembled a strong team following an aggressive recruitment drive to run its investment banking operations. “The key players to drive the financial business of the group are all in place. Since they are coming in once again on executive positions, it could signal that more things are brewing at ECM,” says an industry wag. That appears to be closer to the truth than one thinks. According to sources, negotiations are being pursued at the moment, which are close to fruition and when completed, will result in ECM adding a new major core business to its current single staple of financial services activity, which will see its business transcend domestic boundaries. “The new business is involved in a global high growth sector,” says a source. As a result of the deal, it is also believed that ECM will see the entry of a couple of key shareholders who are notable and prominent personalities in the international corporate stage. It is further believed that Datuk Tony Fernandes of AirAsia Bhd fame will also emerge as one of the key investors in the newly enlarged group. Sources say that Kalimullah and Lim’s `return’ to ECM signals that there are bigger plans waiting to unfold for the group in which the two personalities will play a major role. At this juncture, no one is quite ruling out the possibility that it may eventually result in them raising their stake in ECM. Also interesting is that the rumour mill has been churning out speculation that ECM’s investment banking business is up for grabs. However, sources close to the company deny such talks, saying that until the group manages to maximise the value and grow its investment banking business in terms of scale and profitability, it is not likely to be divested. ECM, borne out of a highly publicised merger between ECM Libra Bhd and Avenue Capital Resources Bhd (ACRB) last June, provides a whole array of financial services namely investment banking, stockbroking, asset management and principal finance and investments. The holding company of the enlarged group was incorporated on October 24 2005 as Avenue International Capital Bhd to facilitate a reorganisation exercise of ACRB Group, which saw the listing status of ACRB on Bursa Malaysia’s main board transferred to ECM Libra Avenue on June 28 2006. In August last year, Kalimullah, ECM co-founder David Chua, as well as Khairy Jamaluddin, son-in-law of Prime Minister Datuk Seri Abdullah Ahmad Badawi, disposed of their stakes in the company. Both Chua and Khairy sold off their entire interest in the group while Kalimullah retained a stake of just under 5%. At that point, tensions were running high, and there appeared to be much scrutiny among a pocket of society over the individuals’ business involvements, more so in relation to the merger deal that was proposed between ECM Libra and Avenue Capital Resources Bhd. Both Kalimullah’s and Khairy’s stakes were acquired by Amcorp Group Bhd while Chua disposed of his entire shareholding to a foreign fund management company. “I am giving up to protect ECM,” Kalimullah had then said in an interview with a business magazine. However, there appeared to be some disappointment among investors of ECM who bought into the company’s shares on the potential that these well-connected and influential businessmen would be able to drive ECM to greater heights, more so because the investment banking business is very much one that thrives on relationships and networking. “For as long as these individuals were in the driver’s seat of ECM, investors thought there could be upside to be gained from investing in its shares. But when they left, some investors were nonplussed,” says an observer. It appears that these individuals, or at least two of them, will soon be back in ECM to make good that promise of potential. Yet, thus far, ECM has made some good strides and progress in the financial services sector. For the year ended January 2007, sales rose by about 55% to RM121mil from the previous financial year. Group sales for the fourth quarter increased to RM41mil from RM16mil in the preceding year’s corresponding quarter. The improvement was largely attributed to better performance of the group’s stockbroking business given the much-improved trading volume in the local bourse and higher placement fees. Higher operating cost for the year, largely due to the combined costs of the merger (with ACRB), however led the group to post a lower pre-tax profit of RM19mil for the year against RM54mil previously. The decrease was also due to rationalisation expenses of RM17mil. Considering the market’s euphoric performance so far this year, ECM’s performance for the first quarter of the year is likely to see further improvement, says an analyst. In addition, the group’s stockbroking subsidiary ECM Libra Avenue Securities Sdn Bhd is awaiting the approval of Bank Negara for an investment banking licence, which analysts reckon will materialise pretty soon and will allow the group to offer a more comprehensive range of investment banking activities which it currently is not able to do namely deposits taking. According to global deal flow data provider Dealogic ECM Analytics, ECM Libra Avenue Securities ranked top spot in book runners for share placements (in terms of deal value and number of shares) in the primary and secondary market (refer to table). The IB team of ECM is currently run by group deputy CEO T. Jeyaratnam who left Aseambankers to join the group in October last year. He replaced Cheah Teik Seng, who stepped down as CEO and is currently involved in a private equity firm. With over 20 years experience in the field of investment banking, Jeyaratnam brings to the group a wealth of experience in corporate finance knowledge and skills. Chartered accountant Raja Ali Raja Othman, the deputy chief executive officer of the group’s investment banking business, also has a sound knowledge and experience in both financial and corporate advisory services. “The group has hired many skilled and experienced personnel to drive its IB and equity capital markets business. It’s still on a recruitment drive. Almost everything is in place,” says a source close to the company. The group has also been in the corporate limelight recently with the emergence of Tan Sri Azman Hashim as the single largest shareholder. He raised his interest in the company from 7.4% to over 22% after acquiring a block of shares in ECM from Aroma Teraju Sdn Bhd – a vehicle of the Minister of Finance Inc in late February this year. While this has led to speculation that Azman has plans to play a bigger role in the company, other astute market observers say it may more likely be a pure investment opportunity for the banker. The slew of changes in ECM has also attracted significant interest in the counter. Year to date, ECM shares have fared relatively well and have gained over 40%. It emerged as the third most heavily traded counter on Friday, gaining 7 sen to close Friday at RM1.04. So how about we now hear it about AirAsia. Does Khairy’s ultra close relationship with Tony Fernandes, via Jason Lo, has translated to some business arrangements? It is so obvious, with AirAsia’s strong support of Khairy’s MyTeam and their both’s affinity for the Manchester United. Lets see the bigger picture now, plus the “Airline Rationalisation Plan” which saw the national carrier Malaysia Airlines’ strategic advantages are being systematically and structurally ‘cannibalised’ for AirAsia prosperity. KUALA SELANGOR, April 28 (Bernama) — The Barisan Nasional retained the Ijok state seat with increased majority of 1,850 votes in today’s keenly-fought by-election, returning officer Haris Kassim announced at 8.42 tonight. BN won in all polling stations except Bukit Badong. It shows BN lost in kampung Ijok and Pekan Ijok, not like previously reported, Bukit Badong. Congratulations YB Cikgu K. Parthiban, BN candidate for Ijok and YAB Dato’ Seri Dr. Mohd. Khir Toyo, BN Chairman for Selangor. This also proves that BN Deputy President YAB Dato’ Seri Mohd. Najib Tun Razak’s campaign strategy and tireless personal involvement for the last ten days was very successful despite Anwar Ibrahim’s and most of the PKR intense campaign is based on serious attempts in discrediting Najib with rumours and baseless allegations. Former UMNO President and Prime Minister YABhg Tun Dr. Mahathir Mohamad explained today on the report that Malaysiakini carried out stating that he had campaigned for the people of Ijok to vote the Oppositions. He said it important that the people should send signals to the leadership about certain issues without defying their support for Barisan Nasional (BN). Tun Dr. Mahathir said he would never turn his back against UMNO and BN. He was speaking at an event in at a private orphanage function in Batu 6, Bukit Naga, Section 32, Shah Alam, Selangor this morning. The theme was “Majlis Jasamu DiKenang dan Terima Kasih Tun Dr. Mahathir”. He also appreciated the people’s tribute for him, like the one in Bukit Naga this morning. He reminded further that is a very integral part of the Malay culture to acknowledge the elders’ contributions in society. The former Prime Minister was his usual cheery and bubbly self in the suburbs of Shah Alam, this morning. As he said in private before, the opportunity for him to meet the rakyat gives him strength and rejuvenate his will to move forward. His usual warm smile illustrated it all. Khalid forgotten how much he bought Guthrie? Here is more on the Ijok ADUN wannabe. PETALING JAYA: Tan Sri Khalid Ibrahim said his acquisition of shares in Guthrie Bhd was a commercial transaction. “The idea of obtaining the share options was first suggested to me by the late Tun Ismail Ali in 1994 and it was agreed by the chairman of Yayasan Pelaburan Bumiputra (the holding company of PNB), then Prime Minister Tun Dr Mahathir Mohamad. “I acquired them at market price and it was a commercial transaction, not free or discounted shares. This matter remains in court and any further discussion should happen during the court proceedings,” he said in a press statement yesterday. Khalid, also a former Permodalan Nasional Bhd chief executive officer, was commenting on Deputy Prime Minister Datuk Seri Najib Tun Razak’s claim on Wednesday that Khalid’s animosity for Barisan Nasional was because he had failed to acquire a 20% stake in Guthrie. Khalid said he planned to sue Najib and those who had made false and unfounded statements about him. In a separate statement, Parti Keadilan Rakyat adviser Datuk Seri Anwar Ibrahim said he was instructed by Dr Mahathir in 1994 to write a letter to allow Khalid to purchase Guthrie shares at market price. “I have known Tan Sri Khalid Ibrahim for many years. During my time as Finance Minister, he approached me on many occasions for many issues, but never once had he ever asked for shares or allocation for his own benefit. “I was and still am very impressed by Khalid’s honesty, integrity and his concern for the common people by introducing the Amanah Saham Nasional and Amanah Saham Bumiputra schemes in the country,” Anwar said. KUALA LUMPUR — The chief executive of Malaysia’s huge national investment corporation will leave his post with a hefty golden handshake and the promise of more gains to come. Permodalan Nasional Bhd. said Thursday that Abdul Khalid Ibrahim will acquire up to 20% of its publicly listed subsidiary, Kumpulan Guthrie Bhd., when he leaves his post as PNB chief executive on July 1 to become Guthrie‘s deputy chairman and chief executive officer. Datuk Khalid will initially buy a 5% stake in Guthrie, or 50 million shares, for 125 million ringgit ($48.1 million), or 2.50 ringgit a share. He will also have a three-year option to buy an additional 15% of Guthrie at a price to be determined. Guthrie stock closed Thursday at 3.96 ringgit per share, up 24 sen. That means Datuk Khalid will enjoy an immediate windfall, on paper, of about 73 million ringgit. But Datuk Khalid said at a press conference that he intends to hold his Guthrie stake as a long-term investment, and plans to expand the company. “PNB wants Guthrie to be a corporation that could challenge . . . other multinationals in Malaysia and elsewhere,” he said. Guthrie, one of Malaysia’s biggest plantation concerns, last year made a pretax profit of 101.4 million ringgit on revenue of 1.05 billion ringgit. The company currently is 90% owned by PNB, a government-created investment holding company that manages a portfolio valued at about 20 billion ringgit, the bulk of it in the form of unit trusts owned by more than three million Malaysians. Datuk Khalid will be replaced at PNB by Mohamed Hilmey Mohamed Taib, a 41-year-old former banker and accountant who is currently PNB’s deputy chief executive. Datuk Khalid, a 47-year-old former university lecturer and merchant banker, joined PNB in 1978 and helped direct the then-fledgling investment company’s growth into a mammoth stock-holding concern for Malaysia’s “bumiputra,” or indigenous, citizens. He also helped create a unittrust scheme whereby bumiputras, mainly ethnic Malays, can purchase shares in PNB’s underlying stock portfolio and reap hefty dividends. PNB’s after-tax profit rose 17.5% in 1993 to 736.9 million ringgit. PNB made an international splash in 1981, when it wrested control of Guthrie from the company’s British shareholders through a one-billion-ringgit “dawn raid” on the London Stock Exchange. 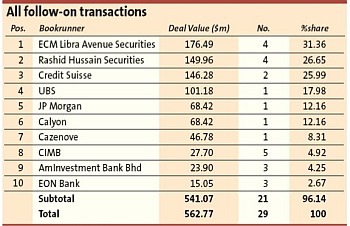 PNB’s other long-term investments include stakes in Malaysian Mining Corp. Bhd. and UMW Holdings Bhd. Although Datuk Khalid‘s shift to Guthrie was expected, some Malaysian securities analysts were surprised at the heavily discounted 2.50 ringgit price for Guthrie shares that PNB offered its departing chief. When PNB floated 10% of Guthrie on the Kuala Lumpur Stock Exchange in 1989, the company pledged to offer an additional 20% of Guthrie‘s equity to the public. The prospective sale to Datuk Khalid fulfills that promise, but it means PNB is passing up the chance to seek a higher price for Guthrie stock from other bidders or the public. The PNB chief adds that the arrangement has the support of PNB chairman Ismail Mohamed Ali, Malaysian Prime Minister Mahathir Mohamad and Deputy Prime Minister Anwar Ibrahim. Dr. Mahathir and Datuk Anwar head Yayasan Pelaburan Bumiputra, a government-backed foundation that is PNB’s ultimate holding company. Datuk Khalid says he decided to leave his PNB post for the challenge of owning and running a large company. “A portfolio manager is very different from an operational manager,” he says, though he declines to outline his plans for Guthrie. The company’s earnings have grown only slowly in recent years and Guthrie has begun seeking ways to expand into fields such as property development. Mr. Hilmey, who replaces Datuk Khalid at PNB, has spent 13 years with the investment company, serving as assistant general manager of one of PNB’s unit trusts and general manager for finance before becoming deputy chief executive in 1990. There are clear contradictions on the story, although it is about the same subject. Maybe Tan Sri Khalid Ibrahim “forgotten” what actually happened. He should be reminded what was said and transpired then, before wanting to sue the Deputy Prime Minister, Dato’ Seri Najib Tun Razak for telling the story, as how it happened. Of course, people do their research well, in these sort of campaigns. Sebenarnya, isu yang dibangkit Pembangkang dalam siri kempen Pilihanraya Kecil Ijok ini bahawa sejumlah RM 530 juta berbentuk komsiyen (atau kickback) dari pendapatan kedua dua kontrak ini disalurkan kepada pemimpin politik tertentu, sebenarnya tidaklah logik. Ini kerana kontrak asal kedua dua projek pembelian senjata ini berjumlah RM 3.5 billion + RM 3.6 billion dan jumlah komisyen (atau kickback) yang diutarakan itu ialah 7.5% dari kontrak pembelian, 5% melebihi dari amalan biasa badan industri dan perdagangan antarabangsa (OECD) yang dianggotai negara negara Barat dan maju. Mana mana syarikat perindustrian negara ahli OECD yang membelakangi dasar yang dipersetujui, seperti jumlah komisyen yang boleh ditawarkan keatas sebarang pembelian atau perkhidmatan, akan dianggap sebagai menyalahi amalan sihat dan akan di’pulau’kan dalam mana mana persaingan pembidaan sebarang pembelian peringkat antarabangsa akan datang. 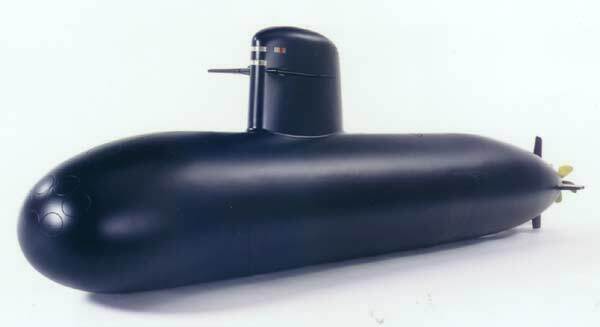 Ini sesuatu yang biasa dielakan oleh syarikat industri negara anggota OECD, termasuk DCNi, Thales dan Pielstick dari Perancis, Ixar Navantia dari Sepanyol dan Whitehead Alenia dari Itali-Perancis dan MBDA dari Jerman-Perancis, pembekal utama program pembelian kapal selam Scorpene. 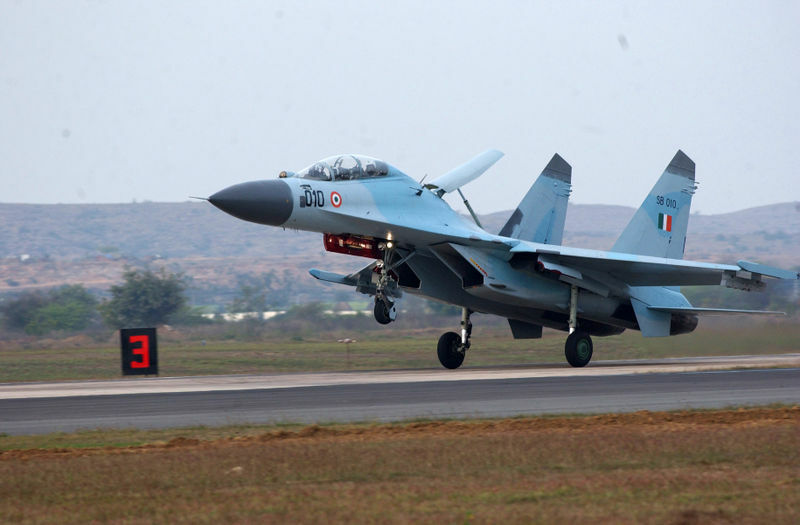 Thales juga pembekal utama avionic bagi pembelian Pesawat tempur utama Sukhoi SU 30 MKM. Paling penting, tiada bukti keatas dakwaan liar ini. Pemimpin yang bankrap politik sengaja mensensasikan isu ini dengan melempar tuduhan tuduhan liar tanpa asas tetapi berbunyi begitu kontroversi dan amat mudah menjadi tarikan masyarkat yang memang sentiasa mencari berita berita kontroversi yang amat sensasi. Reminder: Appointment with the taxman! DYMM Al Wathiqu Billah Tuanku Sultan Mizan Zainal Abidin Ibni Almarhum Sultan Mahmud Al Mukhtafi Billah Shah, Sultan Terengganu telah ditabalkan sebagai Seri Paduka Baginda Yand DiPertuan Agong ke XIII, dalam acara penuh gilang gemilang dan mengikut adat istiadat tradisi. 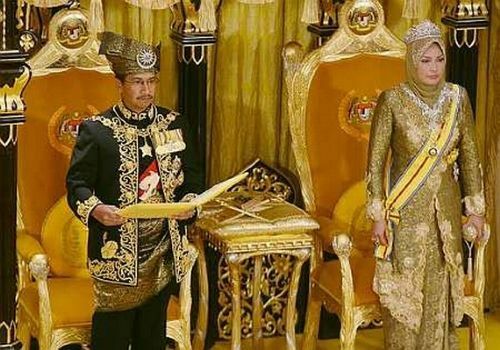 Upacara ini dihadiri DYMM Tuanku Raja Perempuan Nur Zahirah, yang juga ditabalkan sebagai DYMM Raja Permaisuri Agong. Tuanku Sultan Mizan ditabalkan mengikut sistem pengiliran Raja Raja Melayu. Kali terakhir, Sultan Terengganu berpeluang menjadi Seri Paduka Baginda Yang DiPertuan Agong ialah nenda Tuanku Sultan Mizan, iaitu Tuanku Sultan Ismail Nasiruddin Shah, Seri Paduka Baginda Yang DiPertuan Agong ke IV (1965-1970). Peristiwa bersejarah diBalairong Seri, Istana Negara ini dihadiri dan mendapat perkenan sekelian DYMM Raja Raja Melayu. TYT Gabenor Gabenor juga hadir. Perdana Menteri Dato’ Seri Abdullah Ahmad Badawi dan seluruh anggota Kabinet juga dijemput. Antara dif dif kehormat yang hadir ialah mantan Perdana Menteri Tun Dr. Mahathir Mohamad dan isteri, Ketua Hakim Negara, Ketua Setiausaha Negara, Panglima Angkatan Tentera, Ketua Polis Negara dan Duta Duta Besar / Pesuruhjaya Tinggi mewakili Negara masing masing. Peristiwa ini dibawa secara langsung oleh RTM dan TV3. “In the name of Allah, the most merciful and compassionate. “I, Tuanku Mizan Zainal Abidin Ibni Almarhum Sultan Mahmud Almuktafi Billah Shah, am thankful to Allah S.W.T., as with his blessings, I have been chosen as the Yang di-Pertuan Agong. 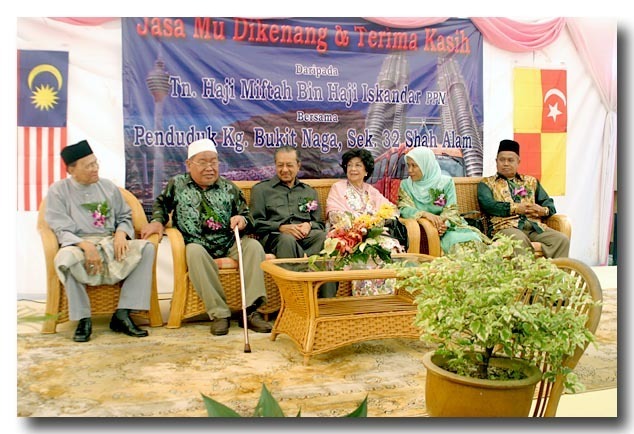 · In a speech at the installation, the Yang di-Pertuan Agong urged the people to maintain unity. Tuanku Mizan Zainal Abidin added that the racial, religion and cultural diversities of Malaysians are not an obstacle but a unique feature to enhance the country’s strength and prosperity. “I admit it’s not easy for a multiracial population to live in peace and harmony. “Look around us, not many are successful, more have failed. “We must maintain this precious unity to the best we can, coexisting together requires us to understand, respect and be tolerant with each other,” he said. · The Prime Minister in pledging the government’s and people’s loyalty and allegiance said that the Government was confident that Malaysia will attain developed nation status by 2020. He added that Malaysia’s strong economy and the implementation of projects and programmes under the Ninth Malaysia Plan would provide the impetus for the rapid pace of development. “This is evident from the country’s total external trade volume surpassing RM1 trillion last year,” Abdullah said. Ini merupakan kali terakhir Negara menyaksikan seorang Raja Melayu ditabalkan sebagai Seri Paduka Baginda Yang DiPertuan Agong diBalairong Seri, Istana Negara. Untuk pertabalan Seri Paduka Baginda seterusnya, ianya akan diadakan diBalairong Seri Kompleks Istana Negara baru yang sedang dibina di Jalan Duta, Dianggarkan Kompleks Istana Negara baru itu akan siap dan mula digunakan pada tahun 2009. Tuanku Sultan Mizan Zainal Abidin Ibni Almarhum Sultan Mahmud Al-Muktafibillah adalah cucunda Tuanku Sultan Ismail Nasiruddin Ibni Almarhum Sultan Zainal Abidin, Seri Paduka Baginda yang DiPertuan Agong ke IV. I. Tuanku Abdul Rahman Ibni Almahrum Tuanku Muhammad (Negeri Sembilan), 1957-1960. Baginda mangkat diatas takhta. II. Sultan Hishamuddin Alam Shah Ibni Almarhum Sultan Allaudin Sulaiman Shah (Selangor), 1960-1960. Baginda mangkat diatas takhta. VI. Sultan Yahya Petra Ibni Almarhum Sultan Ibrahim (Kelantan), 1975-1979. Baginda mangkat diatas takhta. XI. Sultan Salahuddin Abdul Aziz Shah Ibni Almarhum Sultan Hishamuddin Alam Shah (Selangor), 1999-2001. Baginda mangkat diatas takhta. Baginda adalah anakanda SPB YDP Agong II. Court of Appeal ruled today that the sacking of Anwar Ibrahim from Cabinet (Deputy Prime Minister and Minister of Finance) by then Prime Minister Dato’ Seri Dr. Mahathir Mohamad on 2 September 1998 was executed lawfully. Court of Appeal Justices Dato’ Zulkefli Ahmad Makinuddin, Dato’ Mohamed Raus Shariff and Dato’ Heliliah Mohd. Yusof made the ruling today. PUTRAJAYA: The Court of Appeal has held that the sacking of Datuk Seri Anwar Ibrahim as Deputy Prime Minister and Finance Minister nine years ago by the-then Prime Minister Tun Dr Mahathir Mohamad was lawful. It ruled that the Prime Minister has the power to dismiss any Minister in the Cabinet and he could at any time advise the Yang di Pertuan Agong, who is bound to act on his advice. Court of Appeal judges Justices Zulkefli Ahamd, Md Raus Sharif and Heliliah Mohd Yusof unanimously dismissed Anwar’s appeal against the High Court’s decision to summarily strike out his suit against the Prime Minister and the Government for dismissing him on Sept 2, 1998. The High Court had on Dec 23, 1998, struck out Anwar’s civil action for an order that his dismissal from the Cabinet on Sept 2 was unlawful. At the Court of Appeal yesterday, Registrar Hasnah Datuk Hashim read out the judgments of the three judges. “The Yang di-Pertuan Agong as a constitutional monarch is bound to act on the advice of the Prime Minister. “Therefore, in my view, there was nothing wrong for the first respondent (the Prime Minister) to have stated in the said letter dated Sept 2 1998 that with regret he had to dismiss the appellant from holding the posts of Deputy Prime Minister and Minister of Finance as well as other posts in the Government,” said Justice Zulkefli. Justice Raus said under the scheme of the Federal Constitution, the Yang di-Pertuan Agong was a constitutional monarch who acted on ministerial advice and not on his own initiative. “In short, no Minister can remain as a member of the Cabinet if the Prime Minister decides that he should be dismissed,” he said. He said Anwar was no longer a member of either House of Parliament and that the Parliament, on which he was elected as a member of the House of Representatives had been dissolved. “Thus to accede to Anwar’s counsel Mr Karpal (Singh)’s submission that the case should be sent back to the High Court to have it tried, would clearly be an exercise of futility,” he said. Justices Zulkefli and Raus also stated that the letter of dismissal to Anwar was in accordance with the formality as the Prime Minister’s advice was conveyed to the Yang di-Pertuan Agong contrary to Anwar’s contention. Both appellate judges held this fact was further fortified by an affidavit of the Yang di-Pertuan Agong’s Confidential Secretary Ja’afar Wahab, who affirmed that the monarch had informed him of the Prime Minister’s decision and advice to dismiss Anwar that it was duly accepted. They also said Anwar had failed to challenge this material point. Justice Raus said: “It is a well settled principle governing the evaluation of affidavit evidence that where one party makes a positive assertion upon a material issue, the failure of his opponent to contradict it would usually be treated as an admission”. Anwar, who spoke to reporters after the decision was delivered, said he would file for leave to appeal to the Federal Court. 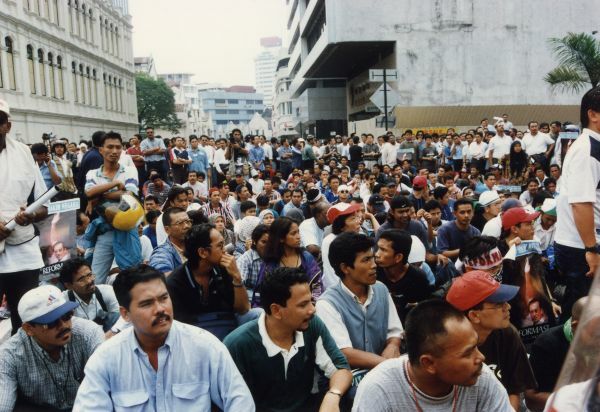 Anwar Ibrahim launched the street mob politics “Reformasi” as a reaction for his sacking. Several unruly rallies were organized. Anwar Ibrahim was arrested by the Police on the evening of 20 September 1998 under the Internal Security Act. 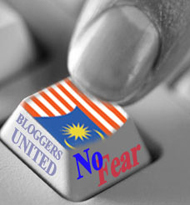 Semalam, semasa kami beberapa orang Bloggers pergi ke Ijok dan diberikan peluang bertemu calon BN, Cikgu K. Parthiban, kami juga berkesempatan bertemu sekumpulan tiga orang ‘mat salleh’ berloghat American, didalam kedai kopitiam yang sama. Mereka menyapa dan langsung berpindah duduk dimeja kami. Rupanya, salah seorang antara mereka ini Pegawai Seksyen Politik di Kedutaan Amerika Syarikat diKuala Lumpur, bernama Tom Daniels. Seorang itu, datang dari Jabatan Negara di Washington D.C. Mengapa mereka ke Ijok? Kami berbual dan sedikit demi sedikit, terbongkar kehadiran mereka. Mereka datang untuk memerhatikan pergerakan dan perjalanan Pilihanraya Kecil Ijok ini. Mereka ingin merasai sendiri apa berlaku di’medan’. Kami bertanya tentang isu isu yang menjadi modal kempen. Sejara am, mereka membincangkan pendekatan kedua dua calon. Boleh dirumuskan, wakil Washington D.C. ingin merasai bagaimana isu isu hangat dan kontroversi yang dibangkitkan Khalid Ibrahim dan Anwar Ibrahim dalam siri kempen ini benar benar mengambil tempat dalam sanubari pengundi tempatan (Ijok ialah kawasan kampung, menjadi sampling baik suara majoriti pengundi Malaysia). Pada mereka, Anwar masih relevan. Isu yang Anwar bangkitkan, masih ‘laku’. Kecenderungan mereka terhadap politik yang dibawa Anwar Ibrahim semenjak 9 tahun dahulu melancarkan ‘Reformasi’ menentang Kepimpinan Perdana Menteri Dato’ Seri Dr. Mahathir Mohamad apabila dipecat dari Kabinet dan UMNO masih segar. Tidak syak lagi. Anwar Ibrahim sahabat rapat Amerika Syarikat. Walaupun kerajaan hari ini bukan lagi Parti Demokratik, tetapi kommitmen Amerika Syarikat kepada pejuangan Anwar tetap sama. Kenapa Anwar begitu relevan kepada Amerika Syarikat? Itu atas tafsiran masing masing. Yang nyatanya, bagaimana mereka yang dilatih pegawai pegawai beribu pejabat diLangley, Virginia ini begitu cekap boleh berada dalam kedai kopitiam yang sama, dimana calon BN K. Parthiban berada petang itu? Ini menunjukan mereka berusaha untuk memahami keadaan di’medan’ dan memahirkan diri dengan geografi kawasan ‘medan’ dalam masa singkat. Walaubagaimanapun, sebagai bangsa Eropah dibenua Amerika Utara, mereka gagal menghayati kenapa K. Parthiban adalah calon yang lebih sesuai bagi mewakili penduduk Ijok. Mereka yang tiada langsung kefahaman dan penghayatan konsep gotong royong dan perpaduan antara kaum, terutama dalam kawasan majmuk seperti pekan Batang Berjuntai. Pada mereka, agenda rhetorik seperti dilaung laungkan Anwar Ibrahim lebih membawa erti kepada pemacuan politik, seperti di Indonesia dan Thailand. Kehadiran wakil Washington D.C. ini di Ijok menunjukan jelas mereka masih memerhatikan dengan dekat politik yang dibawa oleh Anwar Ibrahim dan bagaimana itu dapat mempengaruhi senario politik tanahair, terutama majoriti pengundi berada dikawasan luar bandar. Tanpa sebarang keraguan lagi, Anwar masih lagi mempunyai agenda politik yang didalangi Washington D.C.!